Are you wondering how to add a lightbox to WordPress? When you’re trying to show off your photography skills, or sell your images, a lightbox effect can help to take your business site to the next level. Not only does this WordPress trick make your portfolio look more professional, but it can also give visitors a more in-depth view of the images that you’re portraying. When you add a lightbox to WordPress, you give your visitors the option to zoom in on your pictures and enhance their digital experience in the process. Your lightbox should be responsive, which means that it works just as well on a smartphone as it does on a desktop browser. Though there are plugins out there that specifically focus on giving you a simple lightbox effect, most of the time, you can find a lightbox packaged in with other features like sliders and image carousel tools. As anyone with experience in WordPress knows, having fewer plugins installed on your site will make your portfolio load faster. With that in mind, it’s worth deciding now whether you want to just add a lightbox to WordPress, or a range of photography-focused applications. If you love lightbox effects, but you don’t want any “extras” on your site, then you can simplify the process of adding a lightbox to your site by using the WordPress Gallery function. This tool allows you to quickly add galleries to a page or post within a couple of simple steps. To add a lightbox to WordPress Gallery, you’ll need to add a tool like jQuery Colorbox into the native WordPress gallery using PHP code. To learn how to do this, go here. On the other hand, if you want to add a lightbox to WordPress, but you also like the idea of being able to access additional features like individual galleries, sliders, and even eCommerce features within your portfolio site, then it pays to go for a more complex image plugin. Envira Gallery Pro not only lets you add a lightbox to WordPress with just a few clicks, but it also comes with multiple features for your galleries to make your online portfolio stand out. As the digital world becomes more competitive, your responsive galleries are sure to keep customers on your website for longer! Envira Gallery even comes with simple drag and drop functionality, so creating amazing pages and galleries is easier than ever. If you chose a basic lightbox plugin, then you shouldn’t have too much trouble setting it up. Typically, all you need to do is go through to the Plugin section on your WordPress dashboard and click on the “Activate” option next to your newly-downloaded plugin. However, with a more advanced system like Envira Gallery, you can customize the settings of your plugin to make optimizing your website a lot easier. For instance, you could set up your galleries so that your images dynamically re-size to suit the browser window they’re being viewed in. 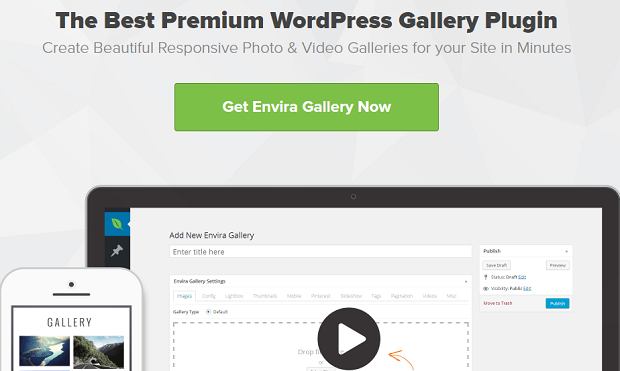 Envira also offers simple gallery templates to help people who aren’t sure how they wanted to get started. Browse through the options in your lightbox plugin to see what you can accomplish. If you want to make sure that you’re not compromising on the appearance of your lightbox images, remember to include the “Supersize addon” with Envira to eliminate image compression. We hope you enjoyed this guide on how to add a lightbox to WordPress. For more digital tips and tricks, remember to follow us on Facebook and Twitter.